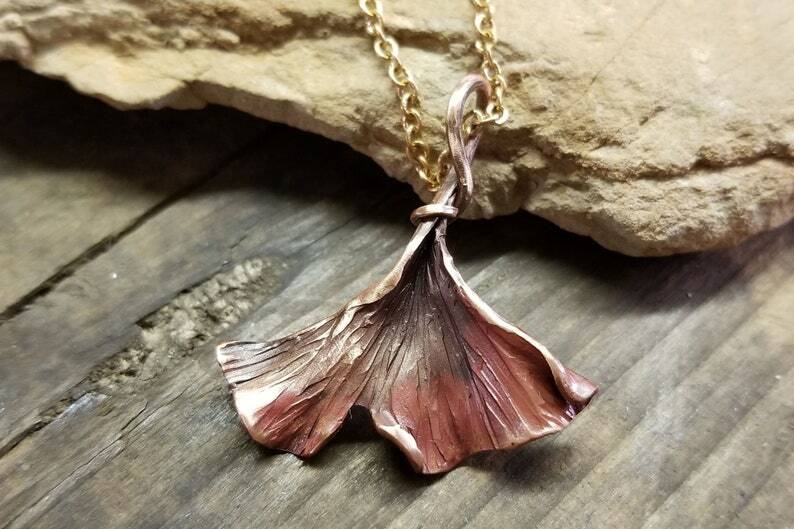 I sawed and hammered this ginkgo leaf pendant from copper sheet metal. I left the natural heat oxide and highlighted the edges. I create each leaf individually, no forms or molds; so each leaf is unique, a one-of-a-kind treasure. The pendant hangs from an 18 inch bronze chain. I'm happy to adjust the chain size to your individual needs if you let me know in the notes to seller. This is the second time I have ordered this necklace. I get so many compliments on it, I just had to have a second in case I lost the first. I love this piece, it is one of my favorites. Kirsten was very thoughtful and I couldn't be more happy with this piece she made for me. I had been eyeing her work for over a year and decided to give myself a Christmas gift this year. She listened to my requests and made sure, before making the Gingko Leaf pendant, what I wanted... right to the last detail. I have received multiple compliments and it just makes me happy to wear such a unique piece of art work. 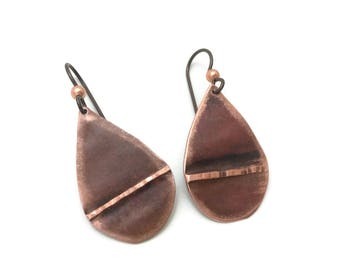 I will be coming back for more because she has so many wonderful pieces on Etsy site. They were a gift for my friend who said they are the perfect size and she loves them. I sell wholesale to qualified USA brick and mortar businesses. Please contact me for minimum orders and availability. I will work on consignment to qualified USA brick and mortar businesses with artist references. Please contact me with inquiries. This metalwork is intended for adults. All jewelry and metalwork may contain small pieces which are not appropriate for children, may be a choking hazard or may have other unintended effects. Metal alloys may contain metals that certain individuals are sensitive or allergic to. If you have a question about the composition of any metal alloy that I use, please contact me for details.